Heeeeeeeeeeellllllllllloooo shas’la! Tommy from TFG here with another article. 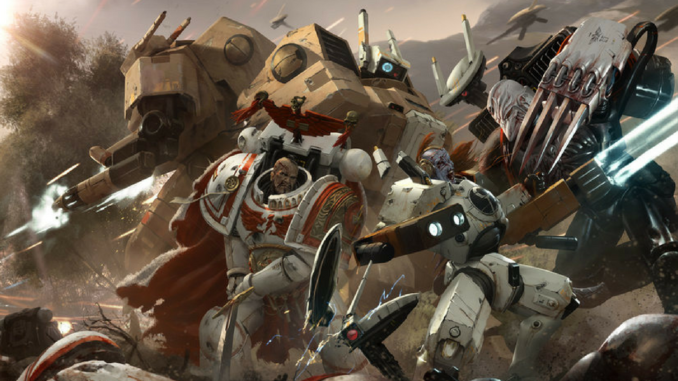 Last time I wrote about current meta lists in competitive play for T’au. You can find that here! While I had promised this week I’d write about Elite choices….well life happens the way it happens and sadly I’m not able to send my glorious thoughts to you yet. Once life settles down I hope to by next week! Until then, I’d like to leave you with my list I’m gonna run at my local store’s October Tourney, as well as the SoCal Open! Troop Transports: 3 Devilfish with 2 seekers each. My plan is to use the Devilfish as a sort of “prairie covered wagon wall” and very far onto my own my deployment line. The Striker teams will be inside along with the Cadre’s, and the Breachers will be with Darkstrider in the last Devilfish. Pathfinders will be placed far front as well, but where they can vanguard advance to better cover (if going second) or better range (if going first). The sniper drones will be placed to hold my backfield objective, the Marksmen will be place to provide marker coverage (or also in the Devilfish to lessen drops), and the Hammerheads and Longstrike will be in an artillery position deep in my deployment zone. The stealth teams will be deployed either to deny deep strike zones, or to hold objectives or gain me Recon or Behind Enemy line points (this tournament will be using the new FLG ITC 8th Edition Draft Missions! Very exciting.) The Vespids will deploy for the same purpose or to snipe characters/deny objectives, and the Coldstar will either do the same or act as a Kauyon lynchpin for my tanks. The goal is to use the Devilfish offensively. Forcing the opponent to focus them will allow my Hammerheads free range to “hammer” (heh) away. Once the Devilfish are dead or about to die, the infantry comes into play and wreaks havoc. By having enough high value targets all over the board, I’ll either force enemy priority away from the true killers that are the hammerheads, or the enemy will not be able to focus enough down time. If I were to change one thing about the list last minute, I’d drop a stealth team, and trade out the vespids and sniper drones for another hammerhead and pathfinder squad. The tournament is tomorrow, Saturday the 14th. I’ll be sure to make a recap with pics and stuff that happened in the day.